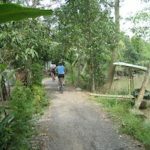 As part of our honeymoon trip to Vietnam, we arranged a 2-day bicycle tour of the Mekong Delta. 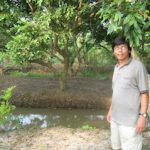 We arranged it through one of Footprint Travel’s (out of Ha Noi) managers named Son. Son and Footprint were wonderful, however, they outsource this tour to Sinh Balo (out of Saigon), so I will spend most of my time discussing Sinh Balo service. Our guide, Manh Ha, was wonderful. His English was great and he was very friendly. The bikes were ok, I would call them commuter quality due to their age, though 100x better than what most of the locals were riding. They also said that the company just bought a bunch of new Trek 7000, so you may end up with something better. I would estimate that less than 5% of the ride had any car traffic at all, though motorbikes will go on any bicycle path. I felt very safe the whole ride. Manh Ha picked us up at our hotel (the Park Hyatt in Dong Khoi) at 8am. First thing I noticed is that the Van had tons of cold bottled water. This made me happy. 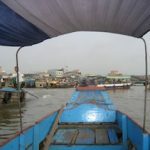 We then drove a few hours into the Mekong. 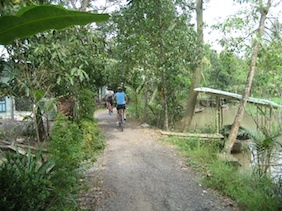 We biked along paths and a Meekong tributary for a while until we got to a “Factory”. This was the only touristy place the whole 3 days (Manh Ha) warned us, but still appeared pretty authentic (just crowded with tours). We got to watch workers make rice paper, peanut brittle and poped rice. We then sat down for tea and candy (my wife’s favorite part). 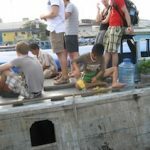 We then biked to an dock where we got on a private Asian motor boat that took us across the river to an Island where we immediately sat down at a nice riverside restaurant to whole elephant ear fish, fresh rolls, pork, rice and soup (food was included, drinks were about 15k dong). 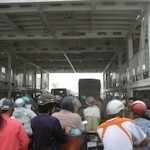 We then biked a while more and got on a ferry across the river to a bigger island and back on the van. 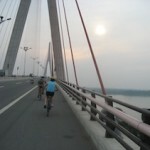 Then back on the bikes where we biked over the Cần Thơ Bridge, the largest (by some definition) bridge in southeast Asia. We soon got on a little boat that took us to another island where they had arranged a homestay. The homestay may have been the best part of the whole Honeymoon. The sign outside said “My Thuan”. 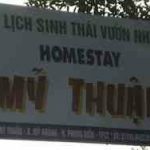 The host was three generations of a nice Viet family that was in the process of converting their small farm home into a rustic B&B. I believe they had four private guest rooms and one large room for groups. 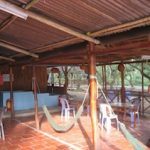 They also had showers (cold), western toilets (not always easy to find), a full size western mattress and mosquito netting. They made a total feast for us for dinner. We had two fried apps (they let us help cook them), elephant eat fish, lemongrass chicken and rice. They even remade the appetizer when my wife mentioned she didn’t like pork. Our host made eggs, bread and fruit for breakfast. Then we got on a boat around 7:30AM and headed to the big floating market. The floating market was pretty interesting, though the best part was stopping to get pineapple on a stick. We then got back on the bikes for a little while. We biked by an 75-year old Viet man’s house, Du Liem (the “Snake Man”). Our guide knew Mr. Lim and often stops when he is on a tour. 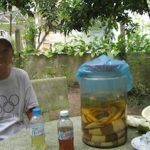 We talked (translated by our guide) for a while and tried some of Du’s homemade snake venom wine and some watermelon a Mr Lim. It was very interesting to hear Mr. Lim’s perspective on the war. The van then took us to Saigon (aka Ho Chi Minh) airport for our flight to Siem Reap. Note: I believe this tour may normally be 3 days, but we modified it to make a flight.